Home Depot just gave me another reason to choose them over another big box hardware store. Not only do they have their free kids workshops (see my Freebies For Kids post), but they also do parties! While at one of the local stores, I saw a sign for a free birthday party. Who can go wrong with free!? I asked at the front desk to get more information. Our store offered a two hour party, on the day and time of our choosing for a party of 10-15 kids. Everyone got a building kit and an apron. The birthday boy would received his own personalized hard hat. We had just started the process of moving when I signed Bernardo up, so he ended up picking the moving truck to build at his party. We were also allowed to bring in decorations and any food/drinks we wanted. We arrived a few minutes early and they had a table set up for food and gifts, and a bunch of tables together for the kids to work at. As the kids arrived, Frank (the wonderful Home Depot worker) wrote their names on their aprons and on a plate. Once everyone arrived, he went over a few safety tips with the kids and the adults. HINT: Get the nails started, hold the edges of the wood and then let the kids hammer the nails the rest of the way in so you don't get smashed fingers. Once everyone received their kits, we started building. I am happy to report that no one received a smashed finger! Once everyone had glued and nailed their kits together, Frank brought out the paint. The kids placed their trucks on their plate and started painting away. There were all kinds of colors to choose from: pink, purple, yellow, green, lime green, white, black, orange, brown. Everyone was happy to have a color they liked. After the trucks were painted, we placed the decorative stickers and wheel pieces in the kids aprons to be put on after the trucks dried. Next, it was onto singing Happy Birthday and food/cake/presents. On our way out, Frank brought plastic bags to place the still wet trucks in so that our cars wouldn't get messy. We all had a great time and the kids love their trucks. Higgins has already placed several of his Lego figures in the back of his. The Home Depot did a great job making all the kids feel special with their own aprons and Bernardo loves his hard hat. If you have a sliding piece, like the moving trucks back door, take it out of the piece while it dries. Ours dried shut but I managed to open it with a small flat headed screwdriver. **Each store is different. Some of them offer individual parties and some will set aside a large table at their free Saturday workshops for your group. Make sure to stop in your local store or give them a call to figure out the details. Our store also asked that there be 1 adult for every child to help with the build. If your helpers did a good job, please send Home Depot an email with the names of your helpers and store location. 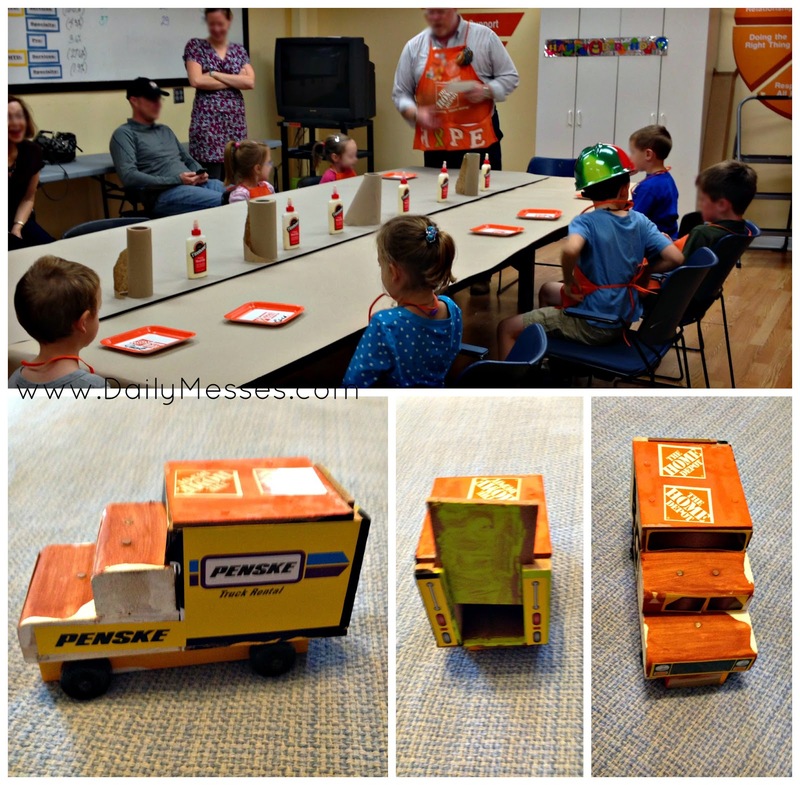 Our party helpers were not allowed to receive tips, but did get rewards from Home Depot based on positive feedback from customers.